It's one thing to know that you're attending what has quickly grown into the largest annual high-end show in the United States. It's something else entirely to try to take in even a third of the 180 exhibits that were spread over the width, breadth and height of the Denver Marriott Tech Center. RMAF 2010 drew such a huge rush of attendees on the first day (October 15) as to cause at least one overly packed elevator to spend what seemed like a minute in limbo, considering whether it should dare try to ascend. When it finally determined to go up rather than crash down, it moved in fits and starts, and shuddered each time it reached a floor. I think more than one of its occupants took a vow then and there to finally lose some weight. Stereophile ran out of their new-at-the-Show November issue by the end of the second day, and when a member of the Colorado Audio Society donated his collection of back issues to us on Sunday (see the photo), they were all gone within minutes. Show exhibits extended to eight packed floors, and down into the lobby level. 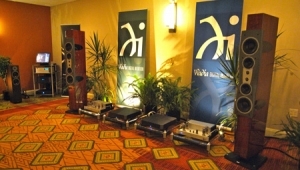 Among the highlights were the return of Head-Fi's CanJam, devoted to headphone listening; two live concerts by pianist Robert Silverman in the lobby; 14 seminars in the Aspen Ampitheater delivered by the likes of Harry Pearson and John Atkinson; and other seminars in the Nordost and Magico/Marutani Consulting/Audio Salon room conducted by leading engineers and researchers. 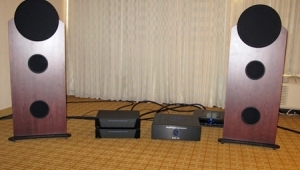 The wonderful Marjorie Baumert, who continues the show she and her late husband, Al Stiefel, began in 2004 with the assistance of the devoted members of the Colorado Audio Society, had only begun to add up attendee numbers five days after the show ended on October 17. Even before she could get her hands on all of her data, she did her best to supply preliminary figures for this report. Baumert's first totals indicate 125 press registrations; 1025 exhibitor badges printed, serving exhibitors from 41 states and 19 countries; 1475 actual unique pre-registered attendees from 48 states and 8 countries, most with 2- and 3- day passes; and 1385 actual walk-in attendees from 3 states and 8 countries, about half of whom had 2-day passes. Compared with last year's figure of 3700 attendee-days, Marjorie believes that attendance increased about 12%! "I am really pleased, but haven't done a statistical analysis yet," she writes by email from Oregon, where she has retreated after the show. "No wonder we had to recycle the lanyards." If I may indulge in some personal reflection, this was the show at which I tested my limits. 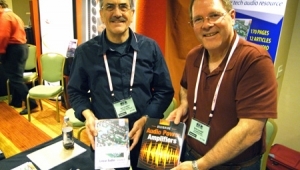 Some months back, I contributed 44 blogs on the California Audio Show. This time around, I attempted to surpass that number. Dashing room-to-room in order to attempt to honor a third of the exhibitors pushed me beyond my limits. Too many invaluable exchanges of information, and far too many luscious LPs and discs were cut short. I'm afraid that the stress perhaps led me to be a bit too hard on some exhibitors. "Frank," writes Trei, "if you were to take your system, pack it up and move it to another state, then be given less than 24 hours to install it in a hotel room you've never seen before, with lousy acoustics, several other systems playing loudly in adjoining rooms, and a questionable power feed, do you think you could make killer sound? 'Show conditions' can be used as an excuse, but [they are] a real problem for exhibitors. As someone who has set up rooms at many a show, I've been there. 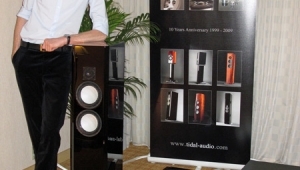 As an attendee, my goal is always to find those exhibitors who do manage to deliver killer sound despite the hurdles set before them, rather than bitching about those rooms that have poor sound for whatever reason. Saying 'product X sounded like crap' really isn't fair until you've had a chance to audition that product under more controlled circumstances." This, then, is the conundrum for both attendees and the press. How literally do you take what you hear at a show as representative of the sound of the ultimate potential of the equipment chain, and how does the press communicate that to readers in a fair and balanced manner? The potentially most problematic day of any show is the first, when already exhausted exhibitors arise to discover what they patched together in the hours allotted to them the day before actually sounds like. Unable to actually play music or break-in tones overnight, due to the hotel setting, they sometimes force smiles at attendees, all the while swearing to themselves to forego dinner and again work through the night to improve the sound. A prime example of the "first day/subsequent days" phenomenon is the experience John, Stephen, and I had in the VTL/Wilson/dCS/Basis/Transparent room. Reading the entire blog, including the all-important postscripts, you discover that, without any further tweaking, the sound in the room improved dramatically after the first day. 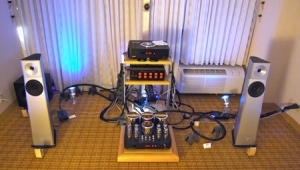 As a result, I have given that room my personal Second Best by Default Room at the Show, with Magico et. al. in first place, and Tidal in third. Only the good Lord or Goddess [insert your preferred deity, politician, life force, or whatever here] knows how that line-up might have read had I visited all three rooms on the final day, playing the same music in each. How many of the rooms we visited and blogged on Day One also improved as much as VTL's is anyone's guess. Though I would never ascribe to the theory that life is a crapshoot, it begins to feel like that when you reflect on what exhibitors are up against in trying to get it right the first time around. There is also the issue of the electrical supply. 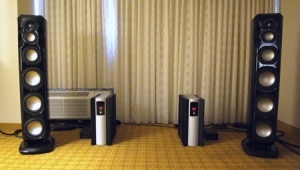 While Stereophile, when it mounted shows some years back, spent a fortune renting a huge generator to supplement a hotel's power, other shows do not. 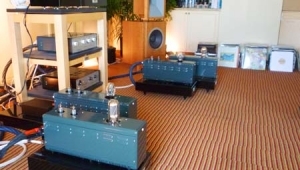 (For the record, Stereophile only ever made a small profit on its shows, and then not every time.) In the case of a recent show, where one exhibitor reported that the bias on the tubes dropped 50% over the course of three days, there is nothing that can be done other than closing the room every hour to readjust. Which, of course, is totally unacceptable. For attendees, there is only one solution. If a room or piece of equipment even remotely sounds as though it might work for you, try it at home. That's the only way you can truly find out. Especially when it comes to loudspeakers, whose sound can fundamentally shift when moved even ½"I am not exaggeratingonly extended home audition will suffice. For the press, there is no simple answer. How much of what you hear do you actually report, and to what extent do you portray it as representative of the ultimate potential of components? When you take into account all the blatantly less-than-synergistic equipment set-ups that arise out of economically motivated room partnerships or dealer mixes rather than purely sonic considerations, it's quite a conundrum. In retrospect, prodded in part by "Frank", I fear that my frankness went a bit overboard. Shows are as much a learning process as life itself. Taking the vow that I'm sure many exhibitors have already taken, to do better next time around, I invite you to read what is undoubtedly the most comprehensive joint coverage of RMAF 2010 you are likely to encounter. Great post and great explanation of the real-life conditions of these shows. It seems to me that it's a bit like speed dating. You might make a connection right off the bat, but chances are, you won't really feel it because the conditions aren't ideal. However, you might spot somebody (or a manufacturer) that you could revisit and re-evaluate in the right circumstances -- say over drinks and dinner or back in their listening room. In other words, judging a speaker, amp, source, cable, etc. in this environment is a bit like picking a bride - or rejecting one - based on a brief encounter in a noisy bar. Still, it's fun to look (or listen) if only to get a feel for what's out there, right? JVS, killer blog. Kudos to you, and your kindness toward gear that might not have had a chance to shine is commendable. I really really enjoyed the coverage of this show, too far for me to attend and oh so many rooms that I haven't finished reading all of them. BTW, why are there so many different copies of Stereophile at this show and at the Montreal Hi-Fi show we only get one issue distributed? If a rig sounds bad at a show it could be bad sounding equipment or good sounding equipment. You can't know for sure. But if it manages to sound good at a show, then that should be a valid indicator of something being right. Show conditions can't usually _improve_ flawed gear. "why are there so many different copies of Stereophile at this show and at the Montreal Hi-Fi show we only get one issue distributed? 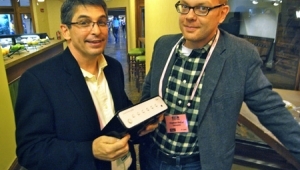 "As Jason explained, after we ran out of the November 2010 issue, a Colorado reader donated his collection of back issues for Showgoers to take. 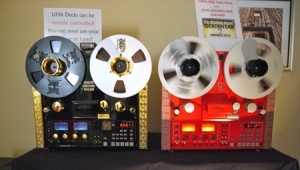 Suffice it to say I don't have the opportunity to get to many shows (given the traveling distance and what's in the piggy bank) but if, perchance, I do have an opportunity to attend I doubt very much it would be to listen to the gear on display. I don't think it would be any great stretch to realize (beforehand) that this is a hotel setting and what could you expect? I'd be there to gaze and scratch and sniff at all the neat stuff but mostly to meet some like-minded audiots (a little name my partner coined for the audio folks) and try to figure out what makes these people tick and enjoy the fact that the ticking exists. Somehow, from my POV, it's as much (maybe more) about the people as it is the gear! Thanks for your good coverage of the show. I enjoyed the show immensely, my biggest regret is not spending more time in the "CanJam" headphone section of the show. Next year I really need to see if I can't attend every minute of the show. 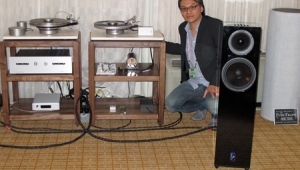 I was particularly impressed by the prototype Sony speakers featured in the IsoMike room, as well as the JBL Everest speakers in the Harman room. It was also nice to meet Roy Hall and see some of Music Hall's new offerings. This is a great show, worth traveling to! Jason Serinus wrote "There is also the issue of the electrical supply. 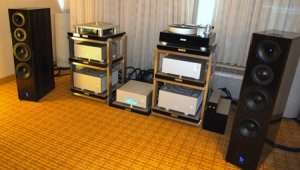 While Stereophile, when it mounted shows some years back, spent a fortune renting a huge generator to supplement a hotel's power, other shows do not. 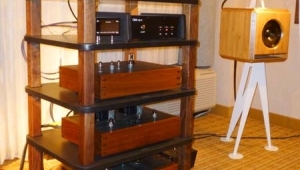 "If I'm not mistaken this was done at a Los Angeles Stereophile Hi-Fi Show at the Marriot or Sheraton Hotel located on Century Blvd. I remember being shocked at seeing heavy gauge electrical wire & the large holes that were chiseled into the stairwell concrete walls to accommodate said wire for the upgraded electrical supply. 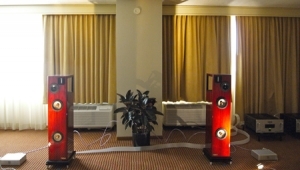 I was shocked that the hotel allowed Stereophile contractors to make such modifications to their hotel. Please correct me if said wiring that I observed was not installed for the upgraded electrical supply. If I remember correctly, a Stereophile magazine show report showed pictures of the stairwell walls with the wiring modifications. 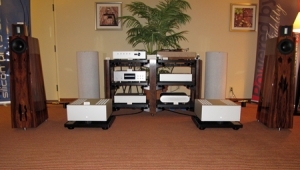 Talk about an audiophile tweak for a consumer audio show!!! I doubt if any hotel would allow such modifications these days! 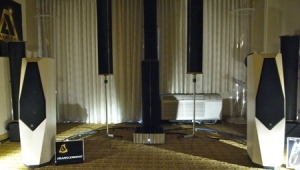 I forgot to mention that the Los Angeles Stereophile Hi-Fi Show that I refer to was held in the 1990's.